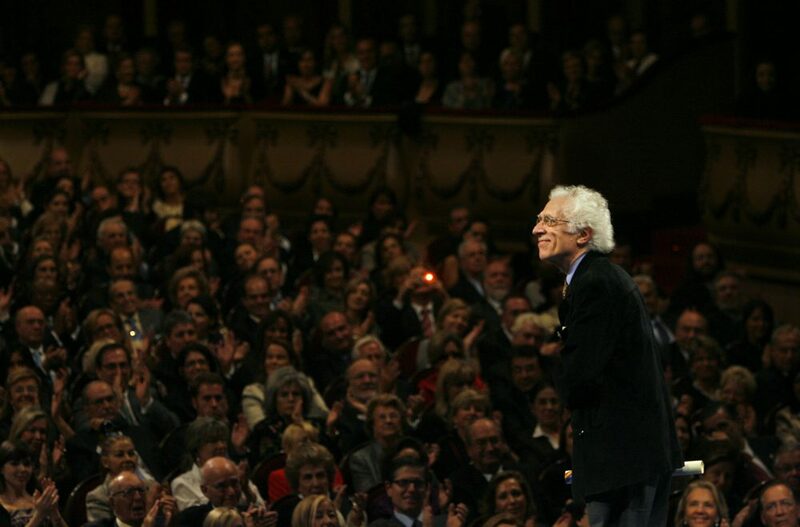 Tzvetan Todorov receives the 2008 Prince of Asturias award for Social Sciences in Oviedo, Spain, on Oct. 24, 2008. Photo by Daniel Ochoa de Olza/Associated Press. Last month, the Bulgarian-French intellectual Tzvetan Todorov died. A scholar on the history of thought, his writings influenced fields as disparate as anthropology, literary criticism, and history. His death was, of course, tragic for family and friends: Stricken by Parkinson’s, he was gone more suddenly than any of us had anticipated. But it was also tragic for readers and citizens who had never met him. The world right now is in great need of the thing Todorov was most passionate about: political moderation. Todorov’s work is diverse and difficult to pigeonhole. He spent his first 24 years in communist Bulgaria, then relaunched himself as a student of structuralism and semiotics in France. In the early 1970s, he established his reputation with his work on the “fantastic” in literature. By this term, Todorov meant that moment of hesitation that readers of, say, Edgar Allen Poe, experience when confronted with the supernatural—a moment during which we are transfixed between belief and disbelief. (A moment that many Americans are now experiencing as they follow the news from Washington.) He soon tired of a theoretical formalism that ignored the human beings who spoke the words and built the structures his colleagues were busy dissecting. Todorov never felt at ease with the moniker “historian.” If pressed, he allowed that he did practice a particular kind of history, one that tried to draw from past events their “moral sense.” In other words, Todorov wanted to know how past events might cast light on our present predicaments. This is why, he explained, he was attracted to complex and confused historical events: “For every affirmation I want to ask myself why the contrary is not entirely false.” His rejection of Manichaeism, of an absolute opposition between two forces, was “the principal message I wish to convey to my readers,” he explained in a book-length interview with Catherine Portevin. For Todorov, it is both the refusal of stark oppositions and the refusal to surrender our humanist heritage that remind us of the importance of political moderation. Today, the world doesn’t have much love for the middle way. For many of us, moderation means an absence of commitment, a lack of intensity and a failure to engage. Moderation is our kindly but clueless cousin who, when the food begins to fly across the Thanksgiving Day table, keeps repeating: “Everyone is entitled to their opinion.” To make the moderate’s day even more melancholy, her worldview does not easily lend itself to theory. Most often, it seems less a political position than a personal disposition. Without moderation, all other values would wither and die. Immoderation in friendship would shut out others, while excessiveness in benevolence would shut down our critical faculties. For this reason, moderation finds itself in the odd position of becoming an absolute value. For Todorov, moderation pulses at the core of Montesquieu’s famous analysis of the balance of powers: “The only thing that can legitimate an instance of power is, paradoxically, its partial abandonment: legitimacy can be acquired … by the fact that the holder of power has consented to share it with others, to impose limits on himself.” Whether the conflicting parties share other values, or whether the regime in which they scramble for power is republican or aristocratic, is ultimately unimportant—as long as they agree on the imperative to share power. This, for Todorov, is simply another word for moderation. And, perhaps, another word for trust: Moderation can only be maintained by a mutual recognition of a shared responsibility for the well-being of a community. But it is with Montesquieu’s epistolary novel, Persian Letters, that Todorov discovers the method to achieve moderation, not just for regimes but also for readers. In his tale of two Persian visitors to Paris, Montesquieu leads his French readers to see their country and customs, their lives and laws, from a foreigner’s perspective. In a famous scene a Persian visitor goes to the opera and regards the box seats, and not the stage, as the focus of activity. Montesquieu reveals the provinciality not of the Persians, but of the Parisians who assume that their way is the only way of seeing. In effect, what Montesquieu gives his readers is what life gave Todorov: dépaysement, or disorientation. Having left his family in Bulgaria and lived as an exile in France, Todorov became a fan of this disorientation. While painful, the experience was also a privilege. Or not, of course. When an interviewer asked him if he had much confidence in humankind, Todorov replied: “Not really.” We are “capable of the greatest outrages” and, to boot, “are not especially intelligent.” As someone who grew up in a totalitarian society, then devoted much of his life to studying men and women facing extremes, he earned his pessimism. But Todorov was an enlightened pessimist. Despite the repeated horrors of the 20th and 21st centuries, he held fast to the values of tolerance and moderation. His faith in moderation is perhaps tested now more than ever before, as cultural and political fissures deepen in the U.S., Britain, and across the EU, including his adopted France. He felt we did not have the luxury of refusing to choose sides—this amounted to the worst of all possible choices. But such a choice always had to be made with one’s eyes wide open, aware of one’s limitations and blind spots. “I do not claim to own the truth,” he wrote, “but I claim the right to seek it.” Too long for a bumper sticker, perhaps. But a pretty good motto as we take Todorov’s necessary, immoderate defense of moderation into a future without him. Robert Zaretsky is a professor in the Honors College, University of Houston. He has translated two of Todorov’s books—Voices from the Gulag and, with John Scott, Frail Happiness: An Essay on Rousseau. His most recent book is Boswell’s Enlightenment. A Life Worth Living: Albert Camus and the Quest for Meaning has just been released in paperback. This essay is part of an ongoing series, produced by the Berggruen Institute and Zócalo Public Square, on how ideas shape our shared reality.